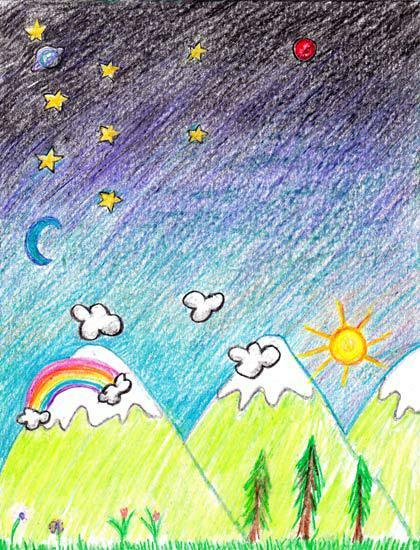 This mountain sketch and sky scene was created by coloring with crayons on card-stock. To create a similar look, design and sketch a colorful mountain scene. As you color in the picture, blend the colors together to create the look of the day turning into the night. Close your eyes and imagine you are in a magical mountain forest 🙂 Think of a few things that you might see. Perhaps you look up to see a rainbow or some flowers. Maybe there are some trees and a sun, and a sky full of clouds. You might picture a moon and even some planets. Once you have your ideas, lightly sketch the outline on the card-stock. Start drawing with the lighter colors first, adding layers of darker colors as you go. Gradually fill in the paper, blending with soft strokes of color that flow together nicely. Then step back and enjoy your creation!